Hurricane Irene has begun pulling boats off their moorings and scattering them along the beach of North Carolina&apos;s National Seashore. 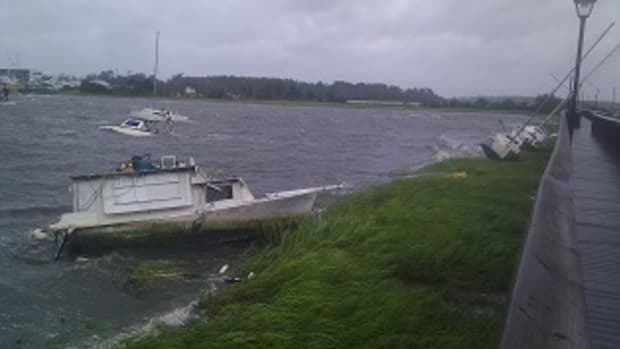 "Some boats are smashing into each other, others are spread out," Lee Sykes, franchise owner of TowBoatUS Oregon Inlet (N.C.), said late this morning from Beaufort, N.C. "I have three sailboats on the Carrot Island National Seashore — I can see the bottom of the keels. They&apos;re way up the beach." 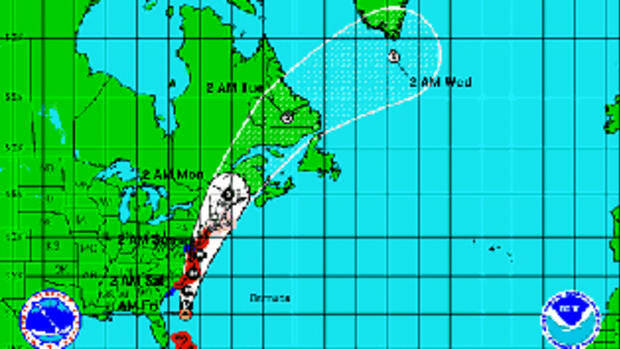 At 11 a.m. Irene was traveling at 15 mph with 85-mph winds. Tropical storm-force winds were up to 460 miles wide — an area slightly greater than the distance from Baltimore to Portland, Maine, according to the Weather Channel&apos;s website. The storm is staying true to its predicted course, which is right up the Eastern Seaboard. The Weather Channel on Saturday morning was predicting that Irene will hit Hampton, Va., at 8 p.m. and reach northern New Jersey and the New York City area 12 hours later. The storm is supposed to remain a hurricane as it moves through New England during the day on Sunday, meteorologists say. Click play to watch Irene’s impact on the coast of North Carolina and damage in the Bahamas. About 10:30 a.m. on the outer banks of North Carolina, Sykes and other mariners had already endured the eye wall of the storm and were waiting for the back side to hit. "The tail of this storm is going to be what kicks Beaufort&apos;s tail," says Sykes, adding that Beaufort lost power about 3 a.m. He said the wind speed was about 50 mph. 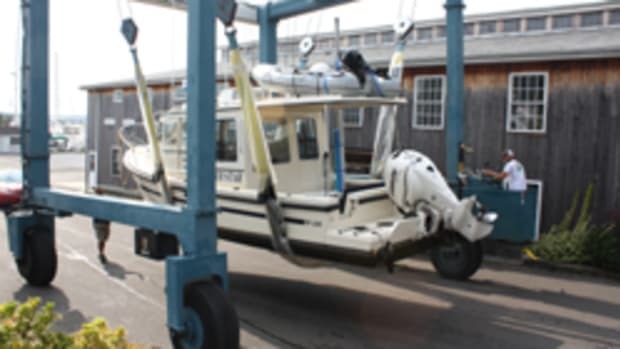 After Irene has lumbered out of the area, Sykes will spring into action, launching a fleet of rigid hull inflatables, including a 36-foot Zodiac. "We have a boat owner of a 40-foot houseboat that just broke loose from a marina and is begging for us to come and get him," Sykes says. "But we told him we&apos;re not coming till after the storm." In Cape May, N.J., boaters were still scrambling Friday night to get their boats hauled, says Sea Tow franchise (Sea Isle/Cape May) owner Capt. Jack Moran. "Right now, Cape May is pretty much a ghost town," Moran said about 11 a.m. "Most of the tourists left, and we&apos;ve been getting steady rain all morning. A lot of boats have been hauled, but a lot are still in the water." Many of those boats are large sportfishing convertibles that came to Cape May for a popular offshore fishing tournament, the Mid-Atlantic $500,000. "We expect the worst from about midnight until about 7 a.m.," Moran says. "Winds are supposed to be from 70 to 80 mph. We can have 70-mph winds in a Nor&apos;easter, so I think we can handle that. But if we get an 8-foot storm surge, that could cause a lot of damage here. We&apos;ll have boats breaking loose and damage at the marinas." Moran has good reason to be concerned. Meteorologists are forecasting a 4- to 8-foot storm surge in the Northeast. YachtWorld’s customer service team is standing by to assist in maintaining the normal online operations as boat brokers get back on their feet. Let us know if you need inventory updates or information from BoatWizard that you can&apos;t access via your phone or laptop. YachtWorld can also add a message to your customers on your YachtWorld homepage. For the Emergency Customer Service Help Line, call 877-274-6805.